When I was younger, and I'm talking late teens or early 20's, I tried to make this dish. Considered to be the signature dish of Spain, Paella is truly for the more experienced cooks to attempt or so I thought at the time. Unfortunately, that early attempt turned out to be quite inedible. The proportions of rice and liquid was way off, leaving the dish with uncooked rice and overcooked seafood. Years later, I again attempted to make Paella. After all, who could resist a tantalizing dish of richly seasoned rice, meats and a seafood variety. I don't recall what I used to make the Paella in but it was not a Paella pan. That attempt worked out quite nicely. 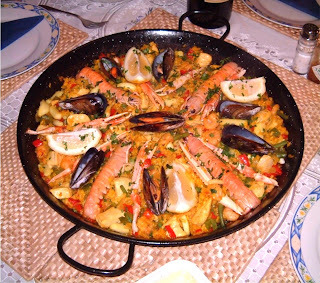 The following are two recipes for Paella. One is considered easy and the other is more like the traditional recipe. Neither recipe has been tried by me but I think that very soon, I will try the second recipe.